How illness, foul weather, and bedbugs turned a long-awaited family holiday trip into a nightmare. 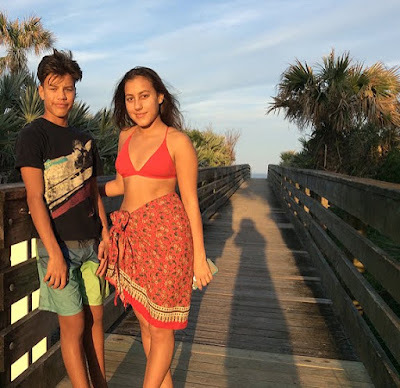 Because my family lives in three different countries, we have made it our practice to get together twice a year so that we can all stay connected and watch the grandchildren, now ages 13 and 15, who live with their parents -- my son, Ajay and his wife, Riitta, in Helsinki, Finland -- grow and blossom. In recent years, over the Christmas break, we have rendezvoused in such exotic places as Vieques, Puerto Rico; Miami Beach, Florida; San Diego, California; and Cozumel, Mexico. In 2017, we had a real problem trying to figure out where to go. There were many requirements to consider: the place had to be affordable; no one should have to ride planes for 30 hours to get there; we hadn’t been there before; Americans were still welcome there; the place had not been destroyed by hurricanes, earthquakes, fires, mudslides or any other natural disaster; it had to have a beach and be warm (for the Finns! ); and there had to be other fun activities. 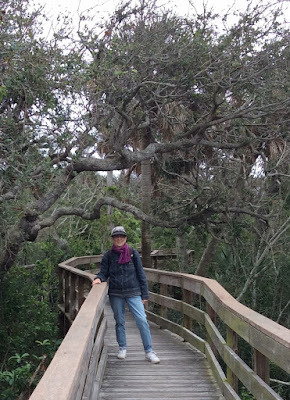 Because of all of these prerequisites, we finally decided on a place much later than usual, in October rather than our usual summer before, and it was New Smyrna Beach, Florida, on the east coast about half-way up the state. No one was excited about this location, but, as always, we looked forward to being all together again. The first two days were heaven! All three flights got into Orlando airport when scheduled, the car rental was smooth, we drove from the Orlando airport to our VRBO rental in just over an hour, and easily found our very attractive beachside rental home for the next 12 days. We settled in quickly, went right to sleep, and arose the following morning to bright sunshine and decently warm temperatures. The house was immaculate, the kitchen the best stocked we’d ever encountered, the beach uncrowded and clean, the water not too chilly. Sizable turtles roamed our back yard, munching our grass. We were happy campers. A second such day followed. On day four, my grandson, Elis, awoke with a high fever and a cough like a barking seal. I’d never heard anything quite like it. He set up camp on one of the sofas in the living room, wrapped in a sweatshirt with the hood pulled up over his head and covered with a fuzzy blanket. He kept a large box of tissues by his side. This went on for the next five days. We couldn’t all go together anywhere, as someone always had to stay with Elis. We could never go out to eat. Also, the weather had completely changed. Gone was the sun and with it, the warmth. Instead, we had gale-force winds blowing the rain sideways, along with cold temperatures. It was impossible to see the ocean just steps from our backdoor, as it was totally socked in. One day, when it was only cold and dreary, and not actively raining, we all, except Elis and his mother, Riitta, went to the Canaveral National Seashore, where we walked on Turtle Mound, a 35-foot miden (archeologist-speak for refuse pile) of oyster shells from the Timucuan tribe between 800 and 1400 AD. Then Riitta had a bad night with itching. She awoke covered with large red welts. We were mystified as there were no mosquitoes and no one spotted any other bugs. After a second night like this, we suspected bed bugs. We tore apart the bed and found evidence. We saw bedbugs of varying sizes, some of their shed exoskeletons, and evidence of their poop, which looked like a Magic Marker swipe on the sheet. We sent photos of the bugs we trapped in a sandwich bag and also of Riitta’s neck, arms and chest to the management. Wilma, who was sleeping a few feet from her parents’ bed on one of the twin mattresses taken from my bedroom, also had a few bites, but nothing like her mother’s. My son, Ajay, sleeping right next to Riitta, had nary a bite, but then that is the pattern in our family: Riitta gets all of the bug bites, no matter where we are. Elis, meanwhile, was in his own bedroom and bath off of the garage. Neither Suji and Geoff, nor I, in our respective bedrooms, had any bites, nor did an examination of our beds yield any evidence. We decided to abandon the room with the bed bugs altogether. Suji went out and bought diatomaceous earth and a queen-sized blow-up mattress. (Diatomaceous earth is a naturally-occurring, soft siliceous sedimentary rock that is easily crumbled into a fine powder. It consists of fossilized remains of diatoms, thus the name, a type of hard-shelled protist -- a large grouping that comprises mostly single-celled organisms. It has many uses in explosives, filtration, abrasives, agriculture, filters, construction, pest control, etc. The fine powder absorbs liquids from the waxy outer layer of insects’ exoskeletons, causing them to dehydrate. More than you ever wanted to know from Wikipedia. We removed everything of theirs except their suitcases from that bedroom to the basement. We put all of the Finns’ suitcases in a circle of the earth in their bedroom so that no bedbugs would get into them, and drew a line of the earth at the doorway so no bugs could escape to go to any of the other bedrooms. That night, we pulled the rented van into the garage, closed and locked the door, and lowered all of the seats so that there was a totally flat space. We wrestled the blow-up mattress covered in a freshly-washed sheet into the van and added some blankets and pillows. Then we all settled down for the night. In the morning, when Ritta threw back the sheet, there was a bed bug. That was it! Suji arranged for a room that night for the Finns at the local Hampton Inn. The Finns then started washing and drying all of their clothes at the hottest possible temperatures. They also washed all of their bed linens. When their clothes were dry, they put them into huge zip-lock bags so no more bugs could get into them. Just before we were to drive them to the motel, they stripped off the clothes they were wearing, put newly washed and dried clothes on, and packed a zip-lock bag of pjs and clothes for the next day. We certainly didn’t want to carry any of the bugs to the motel. One day ahead was as far as we could think and plan at that point. Suji did a lot of research on bed bugs. We are all experts now. They can live for 18 months without a blood meal. Once they’ve had a blood meal, they might not come back to bite for up to nine days. We learned that if we didn’t eradicate them through a heating process, we could all possibly take them back to our respective homes. That was the galvanizing fact! Suji contacted a local bedbug removal service, and got tons of advice on how to proceed. Tickets had been purchased for all of us to go to the Kennedy Space Center, about an hour away, but that plan was immediately scrapped in favor of bed bug remediation. The bed bug guy, who said he had worked for 60 days straight because of the epidemic of bed bugs in the area, told us to put all of our clothes in the zip-lock bags. The rest of us brought all of our stuff down to the basement where we spread it out in a single layer or hung it on hangers from pipes near the ceiling, leaving room to pull the van in, as it had to be de-bugged, too. We threw out hundreds of dollars of food that was not in the fridge, and gave the food that had been in the fridge to our next-door neighbors, whom we had befriended. We brought all of our suitcases down to the garage. We tidied up the house, as we were never going to go above the basement again. Suji and Geoff drove all of the rest of us and huge bags of clothes to the laundromat, then returned to the rental to await the bed bug guy. They pulled the van into the garage. When the bed bug guy arrived, he set up five heaters around the basement and spread a perimeter of poison around the edges, in case the bed bugs ran away from the heat source. He also brought in a number of milk crates on which to spread out all of our stuff, because he didn’t like the way we’d arranged everything. Of course in doing this, all of our stuff got mixed up. He raised the heat to 150 degrees for three hours. While his assistant watched the heat gauge, he drove Suji and Geoff to the laundromat so that they could do their laundry, too. After the three hours, he came back for Suji and Geoff and all of their clothes in new, different zip-lock bags. We did the environment no favor that day, as we had to throw away dozens of barely-used plastic bags, but we had no choice. They paid the man and Geoff came to pick us all up while Suji did her valiant best to separate the things into family piles for easy packing. We all re-packed our bags and checked into three separate rooms at the Hampton Inn for our last three nights, never to return to that house! We didn’t eat dinner until almost 9 p.m. that night, and of course we had to eat all of our remaining meals out. On our last night of the vacation, in probably the worst weather of the trip, we drove to the Kennedy Space Center, not wanting to waste $379. worth of entrance tickets. Since we had had to indicate the day we were coming to use them when we ordered them online, and we had chosen the day before, we weren’t entirely sure we could get in one day later using the original tickets. While it was warmish and drizzling as we left the restaurant after breakfast, the weather proceeded to deteriorate as we drove. By the time we reached our destination, the temperature had dropped probably 20 degrees, and there were again gale-force winds blowing heavy rain sideways and none of us were really dressed for it. My biggest fear was that all of the rain would freeze on the roads, as snow was predicted for northern Florida that day and the next. Happily, it did not freeze, as the sun finally came out. Happily, our Space Center tickets were accepted. Other than having to stand outside in this truly horrendous weather for long periods of time in order to get into various attractions, we had a super time at the Space Center, learned a lot, and were very glad we went. We spent the entire day and actually closed down the place at 6 p.m.
Space suits through the years. Prototype of the Mars rover. Mars is the next destination for NASA. because of extremely treacherous weather in the northeast. Since Geoff’s parents lived only about an hour away, Geoff called them to ask if they could stay with them for two nights, hoping to get a flight out on Saturday, when surely things would be improved in Philadelphia. The following morning, we all went to the Orlando airport. We bid our sad farewells; I went to check in for my flight, which had not been cancelled, as I was going south; the Finns sat down to assess what their plan for getting home might be; and Suji and Geoff took off for the in-laws’. My flight took off as planned, but there were problems with my second flight from Houston to Querétaro, Mexico, and I arrived at my apartment in SMA at 3:40 a.m. instead of the 11 p.m. the previous night I had been expecting. The Finns booked flights from Orlando to Charlotte to London to Helsinki for the following day, found a hotel attached to a mall that had a gym and a pool, and actually fared pretty well. However, immediately upon arriving at home, both Wilma and Riitta came down with what Elis had had, and Wilma missed an entire week of school, and was more than a little hysterical about it. When Suji and Geoff again appeared at the airport two days later, they learned that their flight had been cancelled once again. After an hour and a half, another plane was rounded up and they finally left, returning to Philadelphia non-stop. Another major disappointment was that we all, who are enamored of Mexico’s Day of the Dead, had wanted to see the new Pixar movie “Coco” together. Alas, it had opened in the States for Thanksgiving and by Christmastime, it was long gone. One of the few bright spots in this horror story was that at a very, very low point in the trip, Suji said to all of us, “There is no one I would rather be with on the worst vacation of my life than all of you,” which provided some levity. Years in the future, we will recall this travesty of a vacation and laugh. However, we are nowhere near ready to do that yet.